Japan has several holidays to celebrate children including Doll’s Day (Girl’s Day) in March and Children’s Day (Boy’s Day) in May. This mini-exhibit, curated by students in WFU’s Second Year Japanese class, will explore the traditions and rituals behind these celebrations through objects in the Museum’s collections. 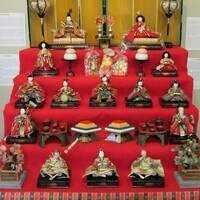 A Doll’s Day set of 15 dolls representing the Japanese royal court will be one of the highlights. Admission is free.